Their debut CD Music is Life includes 2008 QSong BEMAC World Music Award winning piece, Crane Song, featuring internationally renowned bansuri player Taro Terahara. 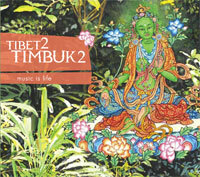 In Oct 2009, Daway Wola won “Best Fusion” in the Music Tibet Awards in Dharamsala. Our friend Tenzin Choegyal is offering the 11th Festival of Tibet April 26-28 at the Brisbane Powerhouse, with proceeds going to the Tibetan Children's Village in India - details here http://bit.ly/2CaNWWI. Over the years we have played many times at this benefit and have come to love and appreciate the devotion that Tenzin brings to his work and his wonderful music. Don't miss this heartfelt gathering in support of the orphaned Tibetan children at the village. Happy Birthday Lou. It was so amazing to sing with the Lou Reed Drone during the amazing week of Reflektor - Laurie Anderson at the Elbphilharmonie, Hamburg. One must experience this Lou Reed Drone. Let the drone dissolve into your being. Thank you Stewart. Thank you with much warm-heartedness Laurie la and Greg Cohen, Rubin Kodheli, Eyvind Kang, Eldar Tsalikov, Elias Stemeseder, Joey Baron, Stewart Hurwood and all the beings of Elbphilharmonie. Leaving Europe with much love. 2 days stop over NYC then then Australia my HoMe. Das starke Festival von und mit der New Yorker Avantgardistin Laurie Anderson hatte einen faden Beigeschmack im Großen Saal der Elbphilharmonie.